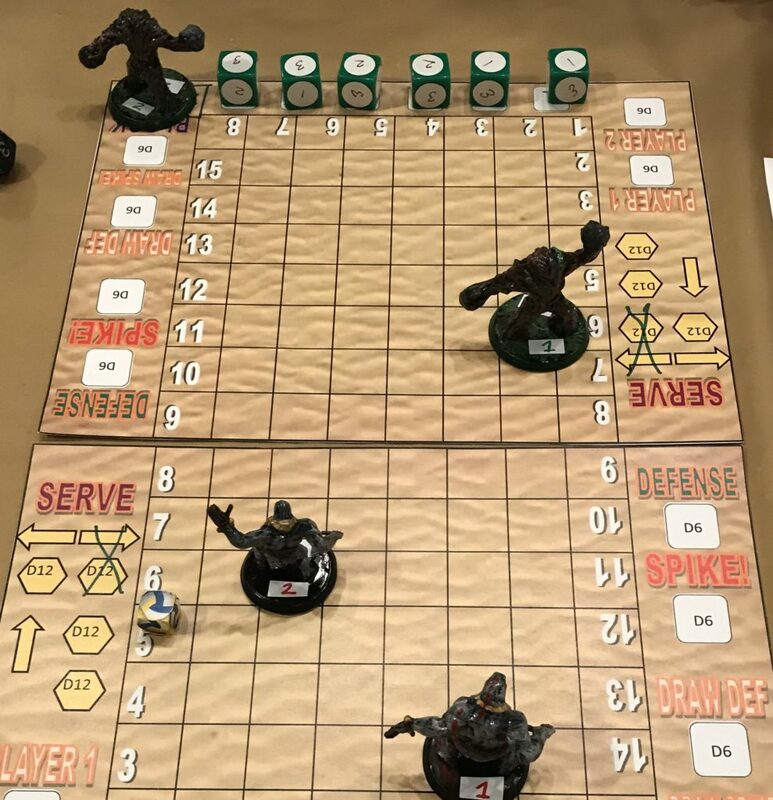 Last Saturday and Sunday, I attended my first board gaming convention – Protospiel in Atlanta. I’ve been in board game development for a bit over two years now and many people are surprised to hear I’ve not attended a convention prior to then. I was always washed up in cascade of (admittedly pretty valid) excuses about time and cost. Then this $50 con shows up two hours from Chattanooga, practically in my backyard. I figured now was a good time to give it a shot. Protospiel conventions are based around prototype board games. Some people attend as designers and some people attend as play-testers. We had a pretty good mix of both. Nestled in a small recreation center in a park in the quiet part of Atlanta was a nexus of gaming creativity. Prototypes ranged from paper-and-pencil to full-on Game Crafter $100+ sets. I’m generally wary of crowds, becoming easily exhausted by the intense stimulation. I’m also very skeptical about the return on investment that game devs can expect from a typical con. Even an inexpensive one like this comes with lodging, dining, and gas costs, easily racking up $250 – 300. I think it was worth it, though. By going to a Protospiel convention, you have the twin benefits of being able to see lots of other prototypes and to have your own tested. Seeing others’ prototypes is wonderful – as many of you know, I’ve got a soft spot for seeing others’ creative work. I walk away with the sense that the world’s better off for it even if the game goes nowhere. I think fostering creativity is that important. Of course, the flip side of this is that having your game examined by serial play-testers, game designers, and the occasional publisher makes for a far better test than 10 or 15 with your family, online through Tabletop Simulator, or even at your local game store. It’s been a wild weekend, so I’ve distilled the best of the lessons down to simple points. It’s the Golden Rule: do unto others as you would have them do unto you. When you go to a play-testing convention, it’s not about just getting your prototype tested. It’s about helping others, meeting people, and sharing ideas and feedback. That is the engine on which Protospiel conventions run. Their very nature tends to attract more designers than dedicated play-testers, which makes it really important that you help others. I know this sounds like a paradox, but my logic is simple. Games need to communicate very clearly through metaphor and halfway-read rules. If you can please people who know how to make games in a loud, busy environment, you’ve done a great job. Everybody is splitting their attention, so if your game remains highly playable, that’s a great sign! These sorts of conventions are “trials by fire” because you have so many factors working against you. You come out with feedback that helps you make the game more polished and accessible. This changes the level of feedback you get. When a game is rough and unpolished, people don’t tend to nitpick rules or phrasing. They look for mechanics and general play-ability. They don’t think it’s weird when you play along or explain the rules. On the flip side, with a polished prototype, people will spot everything – unclear rules, ambiguous text, crappy mechanics, and so on. Think really long and hard about what kind of feedback you want. If it’s time for the fine-tooth comb feedback like what I’m looking for with Highways & Byways right now, it’s worth spending the money on a really pretty prototype. Whether you’re playing in your own play-test or not, you want to interfere as little as possible. If you’re playing, that means giving others the chance to come up with their own strategies. If you’re not and you’re doing a blind play-test, that means answering questions very selectively. No matter what, you want to make sure you don’t give off a doe-eyed “hungry for approval” impression. That could lead to people sparing your feelings, which you don’t want. You need hard feedback sometimes! This is why I like asking people to fill out anonymous feedback forms – it gives people a chance to roast you and get away with it. Going into this convention, I was extremely nervous and trying not to show it. This was especially bad during the first blind play-test of Highways & Byways, where after about 20 minutes, I had to get up and get some fresh air just to settle down. I eventually went on to help play-test someone else’s game, which helped a lot. Highways & Byways left neutral-to-positive overall impressions. Despite not making the perfect impressions I would have liked, I have very actionable feedback. The main problem is pacing – drafting and, to a lesser extent, movement are both dragging. The Event Cards still need to be softened some – they’re a bit negative for testers’ tastes. Construction might be simplified from 10 cards to 5, which would have fringe benefits for usability and manufacturing cost as well. If you bump the board, may God have mercy on your soul. I may not be able to do anything about this, but I have to at least try. Still need minor rule, art, event, and component tweaks. The general impression is that the concepts are great, the game is overall good, but it still needs tweaking and refinement. Another good post, Brandon. Keep them coming. I have been to a few small conventions within 300km of where I live. I received more feedback and interest in the smaller community driven cons than I did in the larger ones. Cost is one of my problems. I would love to got to one of those large conventions in the USA, but the cost involved would be money better spent on prototypes, art, marketing and promotion. I have a limited budget, so I have to maximize what will be successful or not. Going to a small convention and getting good feedback for less then $100 is better for me than spending well over a $1000 going to a large convention and hope that I get the same. Of course, one could save up for the large conventions over the year, but with the amount of gaming conventions, you still have to pick your battles. One of our local game designers is setting up a protospiel style convention here in Edmonton, Canada in March 2018. I am looking forward to it. Thank you! If you go in with really good goals, you can definitely benefit from your local con in Edmonton. You can get great feedback, meet the locals, get some fresh ideas, and get some email addresses. You live near a fairly large city, so you’ll definitely get a lot of the benefits of a bigger con. “If you bump the board, may God have mercy on your soul.” Lol. Did this happen?? 1. Asking about non-slip materials for the Travel Markers. Even the slightest change in material could dramatically change usability in this game. 2. Updating the rules to tell you to hold onto your Byway Cards even though you won’t use them during the game. The benefit of this is that it makes a slight board bump an interruption and little more. This is what I have been trying to do in México. Currently we do monthly meetings and it has been working so far… But learning that this is a job of reciprocity is something most game designers should learn. Failing to help others is usually the main culprit for “nobody’s paying attention to my game.” Best thing do is help just for the sake of helping.